Synopsis: At the behest of an old and dear friend, playwright Lillian Hellman undertakes a dangerous mission to smuggle funds into Nazi Germany. Did You Know? This was Meryl Streep’s film début. The film starts out very intriguing, surreptitious, enigmatic. But then the whole thing sort of derails when Lillian (Jane Fonda) spends most of the second act riding around on various trains. It regains steam, though, when she slaps the piggish and misogynistic Sammy right in the face and upturns a table on top of him. 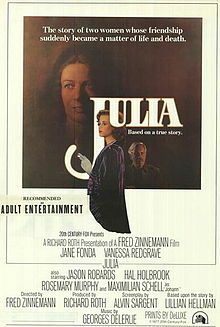 There was literally no point to any of the scenes following Julia’s death; Lillian goes on this quest to find Julia’s baby, but after several attempts her husband, Hammett, convinces her that the baby’s dead too. The the film comes to a close with a short soliloquy from Lillian about how Hammett died before her and how she hasn’t forgotten either of them. It’s unclear whether the “either of them” is about Julia and Hammett or about Julia and Julia’s baby. The film is beautifully acted by Jane Fond and, especially, Vanessa Redgrave, but not even their masterful performances were enough to distract from the screenplay’s sheer lack of direction. Side note: apparently Lillian is more afraid of running alone in a train station than she is of getting stabbed to death by 8 people… she wakes screaming after dreaming of the former, but is only quietly startled awake from a dream of the latter.